The Canadian Classical Music Calendar is our online calendar, with info on all the classical music events and broadcasts in Canada received during the year (from September to September). This unique online database was designed as a practical tool for the Canadian music community to reach classical music lovers across Canada and around the world. It is updated every month. There are 3 ways of getting to the CCMC. In the main menu of most of our pages, click Search and then Calendar, this will bring you to the search form. In our home page, somewhere lower down, there is also a CCMC section. It has a mini search form and a few links to specific pre-set searches. You can go directly to the home page of the CCMC. It first displays all listings for today across Canada. You can then choose in the left-side menu to display listings of another day or a particular region, or you can click on Search which will bring you to the search form. 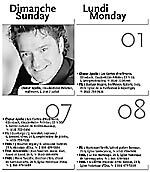 The same search form can be found in the main page of our website, in the right side column, in the section entitled "Canadian Classical Music Calendar". the search results, which displays a set of listings in a summarized format (just a few fields, ending with Region, not the city). Each listing has a link to a details page. the details, which gives complete details of that event, and often features links to websites of the companies involved. 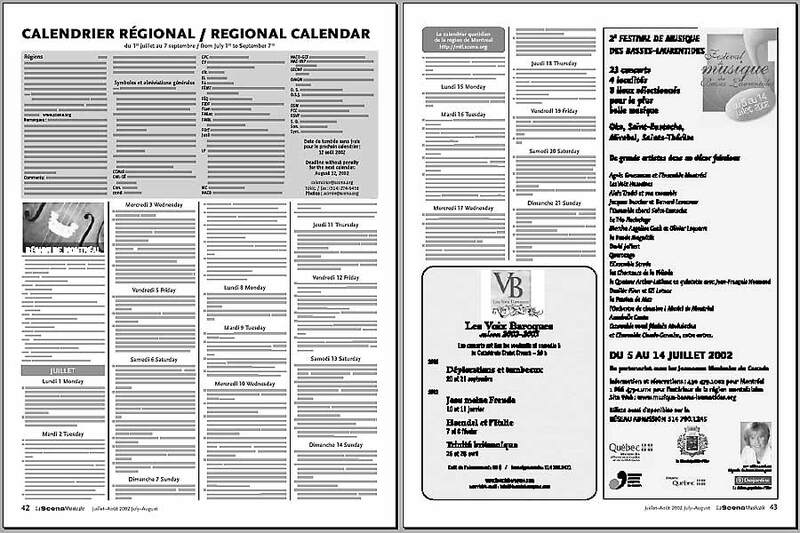 In the Regional Calendar, events are sorted by region, then in chronological order. 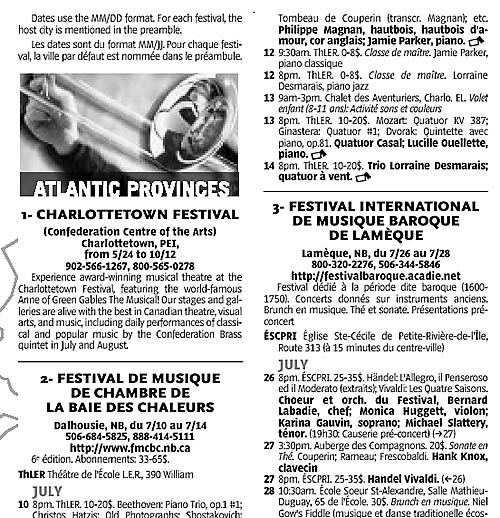 In La Scena Musicale, the Regional Calendar covers all events in the province of Québec and the Ottawa region. In The Music Scene, we used to have a Regional Calendar covering all events in Ontario (except the Ottawa area), Manitoba, Saskatchewan, Alberta and British Columbia. But it was discontinued a few years ago. Those regions are covered only in our web calendar. The radio & TV calendar is part of the Regional Calendar; "radio" and "television" are treated as regions. The only difference is that listings don't have a phone number or a ticket price. 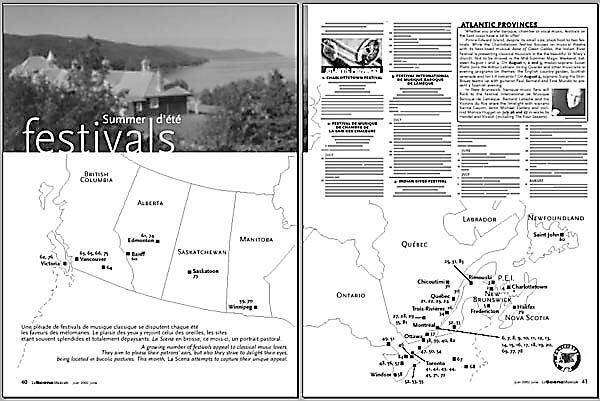 The Summer Festivals Calendar appears in the June issue of LSM and the summer issue of TMS. It covers all classical music summer festivals in Canada, in order of region from East to West, and then in alphabetical order of festival name. 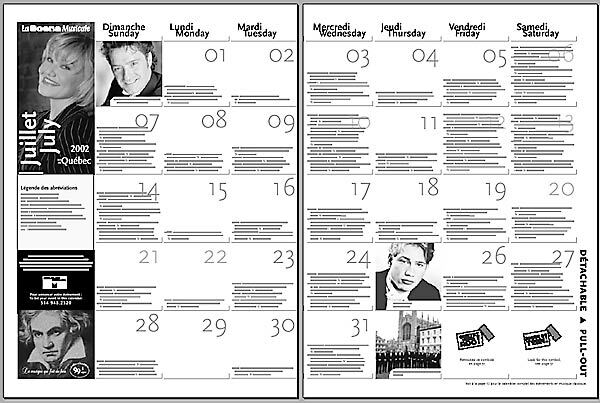 the concert listings (sent to the free calendars department) in a format similar to that of the regional calendar. The Pullout Calendar is independent from the above-mentioned calendars and from the calendar database, is not made by the calendar staff, and is not free. It's a 7-column grid, like a wall calendar. 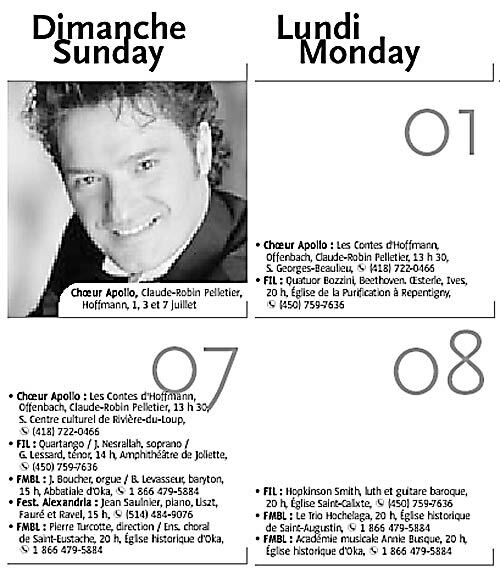 It appears in the middle pages of every issue of La Scena Musicale. It's an advertizing feature. Anyone can have their events listed in it, if there's room left, but the following conditions apply. 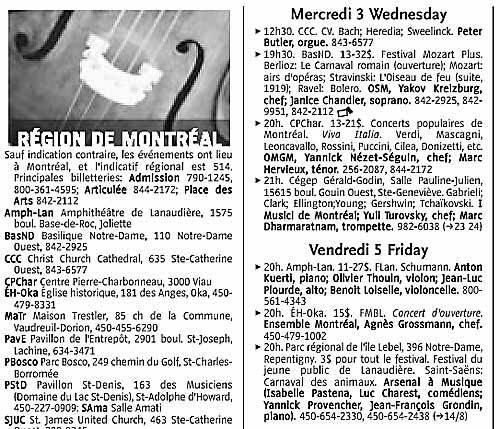 The Conseil québécois de la musique takes care of listing its members' concerts. So members of the CQM should contact the CQM to check that their concert will be included, or for more info. Anyone else wishing to add his/her listing to the Pull-Out Calendar must first buy an ad in the same issue or for the same concert (minimum size: business card), and pay an extra $15 for the pull-out calendar listing. Space is limited, especially for weekend days; first come, first served. For more information, write to pullout@scena.org or call 514-948-2520, or fax 514-274-9456. In our new quarterly magazine La Scena, we publish a calendar of events in other art forms: theatre, dance, visual arts exhibitions (museums, galleries), cinema.